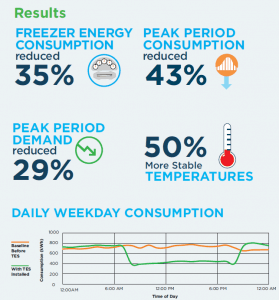 The M&V study concluded that TES provided a 43% decrease in peak period consumption and a 29% decrease in peak demand while improving overall temperature stability by 50% in a frozen food warehouse. Post-study load analysis reports from the utility continue to show 300-500 kW shed for 13 hours, 6 days each week. Why should utilities focus on cold storage? Because it has the #1 highest demand per cubic foot and the #3 highest consumption of any industrial category on the grid. And now there is a behind-the-meter energy storage medium with an LCOE < 2¢/kWh that can handle the high demand and continuous refrigeration run time its facilities require. Viking Cold’s Thermal Energy Storage (TES) technology with intelligent controls allows the energy-intensive refrigeration equipment to be cycled off for up to 13 hours to flatten out demand spikes on the grid. Our TES technology has been tested, accepted, and incentivized by many utilities across North America, and our systems are installed and running in warehouses, grocery stores, and restaurants in multiple countries. Download THE Study to understand the grid benefits of THERMAL energy storage. HEAR THE RESULTS DIRECTLY FROM THE FACILITY OWNER.